Cape Town is home to some of South Africa’s best restaurants but if eating out is a hobby of yours, like it’s a hobby of mine, then you’ll know that it can be costly practice. Of course gourmet food is an art form so the money you pay is for an entire eating experience not just a regular “suppa”. Because the love of food is a starting point for most passionate chefs, DiningCity has created Cape Town Restaurant Week which brings you closer to delicious meals at a fraction of the cost just because they want to share the love! The Taste Festival is one of my favourite festivals in Cape Town. It delivers beautiful, taster size portions of gourmet food offered by the best restaurants in Cape Town at a reasonable price, but it only occurs once a year! Boo! This is why DiningCity’s Cape Town Restaurant Week is so fabulous and they’re taking it to the next level. Restaurant Week is taking the gourmet-for-less concept and has further developed it so that it includes an entire 3 course meal for less. There are two options, the lunch menu is R125 for a 3 course meal and the evening meal is R200 for a 3 course meal. With over 40 restaurants on board, I can’t think of a better way to familiarise yourself with the Cape – through its food. 5 Rooms, Ashton’s @ Greenways Hotel, Baia, Blakes, Bukhara, Cafe Chic, Cafe Dijon, Catharina’s Restaurant, Chandani, Five Flies, Gold Restaurant, Haiku, Il Cappero, Jackal and Hide, L’Apero, La Mouette, Marimba, Paranga, Pepenero, Pigalle, Planet Restaurant, Pure, Reserve, Roberto’s, Savoy Cabbage, Signal Restaurant, The Bungalow, The Duchess of Wisbeach, The George @ Romney Park Hotel, The Grand Cafe and Beach, The Roundhouse Restaurant, Top of the Ritz, Westin Executive Club, Zenzero. Dish @ Le Franschoek Hotel & Spa, Haute Cabriere, Mange Tout, Monneaux and Roca. Ensure that you Restaurant Week Bookings early and do NOT miss out! Click HERE for the full list of participating restaurants, from the Mount Nelson’s Plant Restaurant to Haute Cabriere in Franschoek, there’s food in all corners of Cape Town! DiningCity is an international website that providers readers (and eaters!) with up to date information about restaurants in their country. 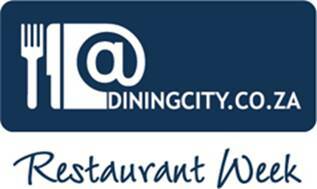 DiningCity.co.za is the South African branch and provides information about hundreds of restaurants for South African patrons. Select a region, location, cuisine and price range and enjoy an array of options to satisfy your cravings.